You can rename your pets! Late last night I noticed that pet battles had been enabled, but only for people who had bought training earlier when it was initially available. In other words you can’t buy training right now, but if you did then pet battles are working. So I went out on the hunt for new wild pets to capture. Along the way I learned a little more about the system and how it works. First off all pets are not the same level anymore. 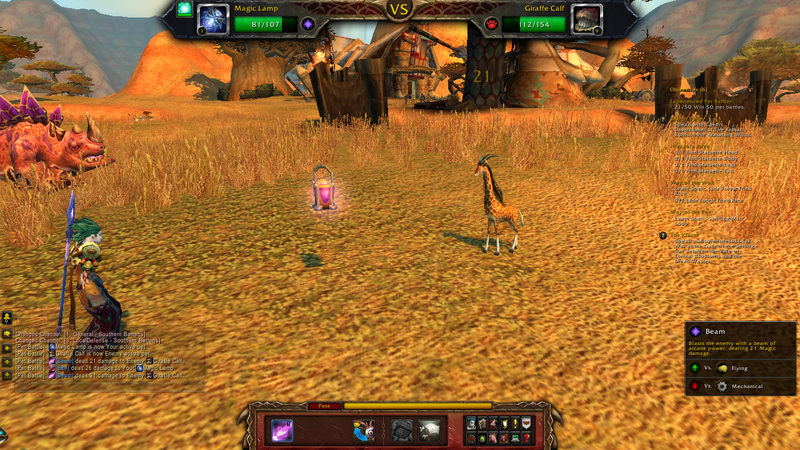 When the Pet Battle System (PBS from now on) was initially available every pet in the world was level 1 and easy to catch. Now they are more level appropriate. 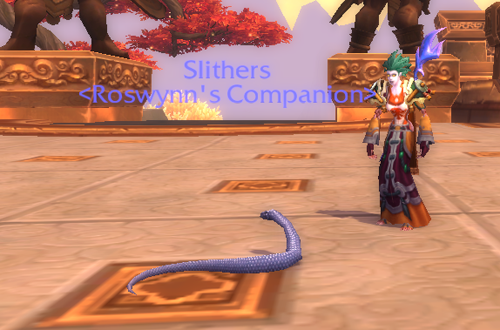 I poked around a bit and it seems like there is a progression in pets just like leveling your characters. I looked at capturable battle pets in a few of the zones and this is what I found. Obviously sending your Level 5 Kingsnake against a Level 24 Gilded Moth is a bad idea, as I learned very quickly. So it’s a better idea to start your pet battles in the lower zones and as your pets gain experience you can move them to higher level zones. Just like leveling a character. 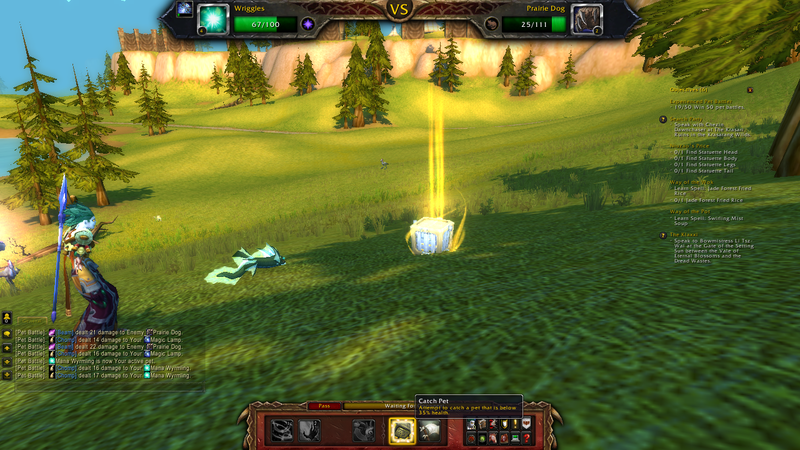 I got the achievement that unlocks the second pet slot just before they disabled pet battles. Now I’m working on “Experienced Pet Battler.” You have to win 50 pet battles for that and it unlocks your third battle pet slot. Your “Revive Pet” spell is on a 10 minute cooldown. This is your heal spell for your pets and you can only cast it outside of a pet battle. So if you’re in an area with a lot of pets that you want to fight you’ll either need a lot of pets trained up to that level and then swap them out as needed, or you’ll want to find a Stablemaster. They can heal/rez your pets as many times and as often as you like. They will be your friends! If you’re out capturing lots of pets there is a limit to the number of pets of the same type that you can carry. That limit is 3. So if I am in an area with a lot of Prairie Dogs I can only capture 3 of them. After that the “Catch Pet” button is disabled. You can cage them and put them in your bags for sale/trade but you can only do one of those before that button is disabled. When you win or capture a pet your character does their racial dance in celebration! I did check out Darkmoon Island this morning and there are no wild pets there. I was disappointed. I figured there would be crazy pets there. Oh well, it’s beta, they still have time to put some there. Speaking of that, even though it seems like the PBS is ready to go, there are still a few things missing. Not all pets have a full complement of abilities yet. In fact most do not. Pets usually have at least one ability, but they should have 6 that unlock at different levels. 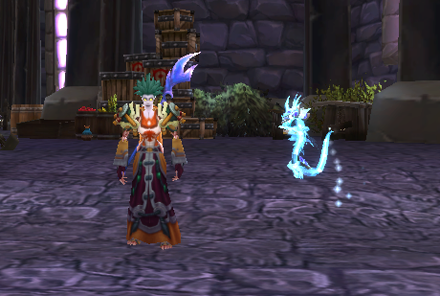 I also have not seen these Pet Trainers out in the world that we’re supposed to be able to learn from/battle with. So while it’s very close to being ready for testing, there is still some work to be done before it’s finished. EDIT: I got the achievement and unlocked the third pet slot. Also got the Celestial Dragon!